Hadley Mace will be holding a public exhibition in order to provide further information about a proposed amendment to the second phase of the Greenwich Square development. This will be an opportunity for local people to provide their feedback on the proposals. Hadley Mace, our joint venture with Mace Group, is delivering the Greenwich Square development, which upon completion will provide 645 high quality new homes, 45% of which will be affordable. 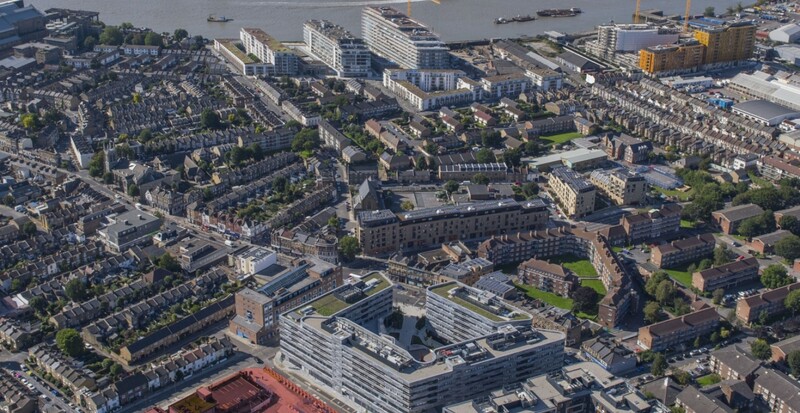 The redevelopment of this site, the former Greenwich District Hospital, is being undertaken in partnership with the Greater London Authority, the Royal Borough of Greenwich, the NHS and London and Quadrant (L&Q) Housing Association. The majority of the first phase, which includes over 350 homes, a leisure centre, an NHS facility and a library, has been built. The community facilities are now all open and there are just a final few homes that we will complete this autumn. Through our partnership with the Royal Borough of Greenwich we have been able to bring first-class leisure and library facilities to the area. The Greenwich Centre currently hosts a modern library with the latest digital technology, a new gym, two swimming pools including a learner pool, and a bright, friendly café which acts as a social hub for meeting up with friends and family. We are also looking forward to welcoming Costa Coffee, which is due to open soon, and we have also had commitments from a dentist and a pharmacy who wish to open new units on site. We are now preparing for the second phase of the scheme, which currently comprises 284 homes and is located in the centre of the site, facing Vanbrugh Hill. We already have planning permission for this second phase but would like to make some minor amendments to it. In order to do this we intend to submit a Section 73 application to the Royal Borough of Greenwich. The amendments will add one additional storey to the second phase, raising its height from six to seven storeys. The design is sensitive to the surrounding streetscape and includes appropriate roof top set-backs in response to the site’s existing context. This courtyard building will still be lower in height than the completed buildings in the first phase and also lower than the previous hospital that was on the site. This additional storey will allow us to build 41 extra homes in the second phase and will increase the number of wheelchair accessible homes. In total the number of homes within the second phase will increase to 325 from the 284 originally approved. We will be hosting a public exhibition of our proposals on Thursday 19 May, between 5pm and 9pm, at the Forum@Greenwich, Trafalgar Road, SE10 9EQ so that you can view the proposals and ask questions of the project team. If you would like to attend then please just drop by, there is no need to book. If you would like any further information in the meantime please contact 020 7612 8480 or email GreenwichSquare@londoncommunications.co.uk. NOTE: now that the consultation has taken place, the boards are all displayed below.